Current Capers is the fifth level of Sea Breeze Cove in Donkey Kong Country: Tropical Freeze. The level mainly consists of currents and spiked balls that the Kongs must navigate. The Kongs begin on a shoreline hollowed by urchin pits, and quickly head underwater. After passing some Red Finleys, the Kongs can use a corkscrew move to spin two rotatable knobs to open their respective doorways, then spin three more knobs while avoiding Sea Urchins, carried by upward currents. After passing a segment full of electrified plants, the Kongs will pass two Blue Finleys and a Gordo before rising back to the surface and reaching the first checkpoint. Upward currents produced by ducts, which descend gradually as the Kongs spin knobs. Above the surface, several Snowmads have halted their ship next to a wooden pier, which has to be traversed. 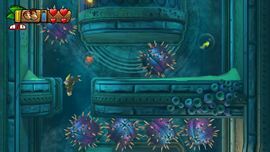 After getting fired from a skull Blast Barrel, the Kongs reenter the water and enter two different rooms with circulating currents carrying several urchin-like globes. The Kongs would have to swim carefully so as not to get hit by the urchins; a number of items enclosed in bubbles also circulate here. An area with Blue Finleys follows, along with two more rooms with circulating currents and urchins. The Kongs will then embark on a downward passage with an opposing current, coming from a construction with several ducts, and must spin three consecutive knobs to gradually lower this structure while avoiding coming Sea Urchins and proceed to the second checkpoint. More electrified plants follow, and the Kongs must navigate them to a Barrel Cannon, and will reach a segment where they must head right and avoid the circular blades that fall on them. After this segment, the Kongs must head downwards, reaching the Slot Machine Barrel in the next room. In an area with electrical plants swaying from side to side. Donkey Kong heads into the letter K.
K: Not long before the first checkpoint, the letter K can be obtained in the area with the electrified plants. O: In the third room with a circulating current, the letter O can be found in a visible alcove on the left. N: In the segment with electrified plants just after the second checkpoint, the letter N can be found in-between two electrified plants. G: Halfway through the segment with the falling circular blades, the letter G is located in plain sight at the bottom. By collecting all of the bananas leading underwater for the first time, the Puzzle Piece appears for the Kongs to collect. After turning the second knob in the level, spike balls and Banana Coins will circle the knob. The Kongs must collect all three of the Banana Coins to reveal the Puzzle Piece, located right in front of the knob. Just before the first checkpoint, the Kongs must reach the top left and open the treasure chest to collect the Puzzle Piece. In the second area with a circulating current, the Kongs must enter a hidden alcove from below and collect all of the bananas in the alcove to reveal the Puzzle Piece. Just after the second checkpoint, the Kongs must enter a passage at the top to access a Bonus Area, and like all other Bonus Areas, must collect all of the bananas to reveal the Puzzle Piece. DK, shortly after diving into the sea. Donkey Kong and some urchin balls are swirled by an underwater fan. On a pier, near which a Snowmad ship is docked. A segment with circular blades slowly approaching DK. This page was last edited on April 15, 2019, at 01:37.